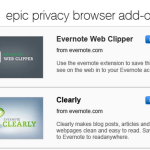 Epic now has a webstore via which you can add addons. From the top menu, select “Extensions”, then on that page click “Get More Extensions”. 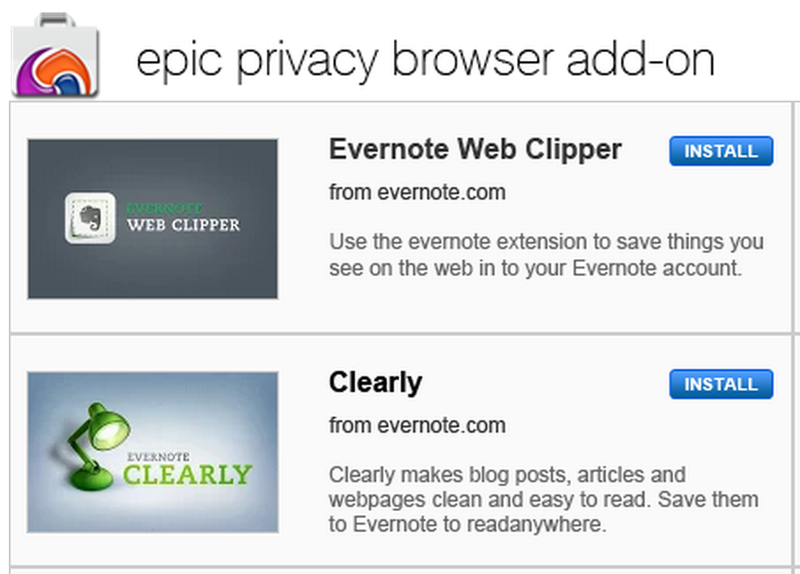 Epic supports password managers including LastPass and Roboform, bookmark syncing apps Pocket and Xmarks, and Evernote. We’re working on supporting more password managers. Let us know other addons you’d like supported as well. Our philosophy is to allow only “essential” addons from trusted firms. If we allowed any addon to get installed, rogue addons could get installed, and many, many other addons (including several privacy addons) actually pass all your browsing through their servers (which defeats the purpose of a privacy browser). We hope these addons improve the usability of Epic! Any possibility for Blur from Abine getting allowed? As soon as you guys support a mousegesture-addon, I’m using Epic again! It’s an epic browser apart from those two cons! Could you look into allowing some Gestures-addon, please? So please, could you look into it, and if not (or if it is really a bad idea) please respond? It really like using Epic browser, the only fault finding is the lack of addons for the translation of some phrases, so they are obliged to use explorer 11 with addons bing translate. There is a safe addons that you can install? Would love to have the Signal Secure Messenger browser extension supported (Open Whisper Systems). I’m really trying to transition to Epic from Chrome. Please add a few basic extensions like spell checker, etc. You don’t completely support lastpass as you do not honor the keep email address and keep password. This is a royal pain in the A$$, fix it or correct you claim to support and mention that you don’t honor those functions. Really nice browser, but I would really love if you can add some designs. The standard design is pretty lame. And is it possible to add noScript or Ublock, Umatrix? dammit let me choose what the fukc extensions i want to install, not everyone is a retard. I WANT MY MENU BAR! Photo downloading extensions; especially Facebook Backup. I have not the basic things for to use this very nice browser all the time. I just use it now and then. I’d like an image capture or page capture as image. Epic is working great and blocking lots of trackers and ads on my computers. The LASTPASS extension works great but I couldn’t get the XMARK bookmark sync. to work… even after all the suggestions offered.